I like to think of this little space as a place people can come to to gather all the news of the craziness that is possible in Kentucky. If you remember you heard about Kim Davis and her hatred for my child gay people. You also heard about Chris Stapleton (ok so that wasn't crazy, he's freakin' talented.) You also heard about the town that stole Christmas, or at least all the joy in a Christmas play. Today I want to continue delivering the news you want to hear. So you can feel happy that your state isn't this insane. Now I completely failed to tell you about the Black Friday brawl that took place in a mall. I skipped that because, Who doesn't get into fights on Black Friday. This story though, its just too good to keep to myself. If you read TMZ you may have already heard it though. A couple got into a fight, and the wife bit her husband. I know, your thinking that sounds like domestic violence and not really national news worthy. How about if I tell you that the fight was over Hillary Duff? Oh yeas people they were fighting over a commercial, he leaned in to kiss her and she bit him on the face. This made TMZ. Because it was obviously a slow celebrity news week. I can't believe Kanye didn't punch anyone, or Angelina Jolie didn't adopt a baby. 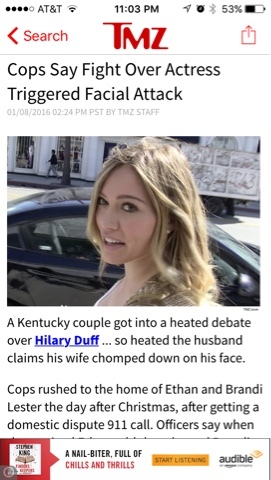 Now, before you think everyone in Kentucky is crazy. There are some awesome Kentucky bloggers that are totally sane. So if you are losing hope in all humanity in the Bluegrass State you can check out Kristin, Brittany, Tif, and Heather. Although, I'm not sure Heather counts because she is normal but she blogs about the crazy things her neighbors do.